Have you stayed here? Write a review! 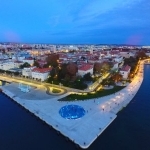 This air-conditioned two-bedroom apartment in Zadar is located in Arbanas, only 100 meters from the nearest beach and 1 km from the historic center of Zadar. Guests have access to the sun terrace and outdoor fireplace. Free Wi-Fi is available throughout the property. Hospital and pharmacy are 200 meters away from the apartments. The accommodation has a seating area, a dining area and a fully equipped kitchen with dishwasher and oven. Also includes towels and bed linen. Guests can also use the terrace with barbecue equipment. It is necessary to pay 30% of the advance upon booking, and the remainder of the amount is paid on the first day of arrival. The check-in time is from 14:00 onwards. Check-out time is until 10:00. You can also change the application time on request. Residential tax is included in price. Apartment Krstić listing has been viewed 1562 times since 04.02.2019. The contents of this form will be sent directly to the advertisers e-mail. It is only to be used to inquire about booking of listed property. Any other use constitutes an abuse of Direct-Croatia.com terms of service.